Sports, comedy, ventriloquism, singing, and chamber music: these acts and more made up Arts Madness, the first special program of Spring 2019. 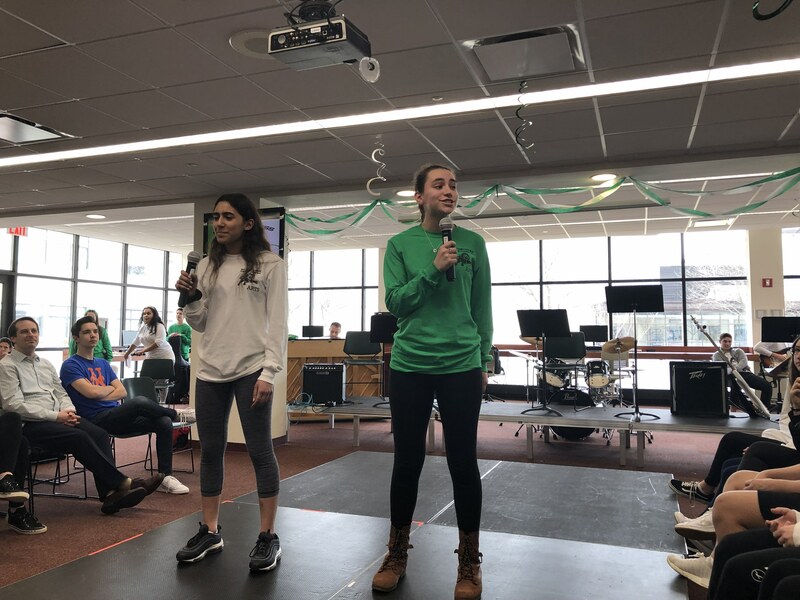 On Friday, March 15, 2019, the entire High School gathered in the Media Center for a performance by Schechter Arts. 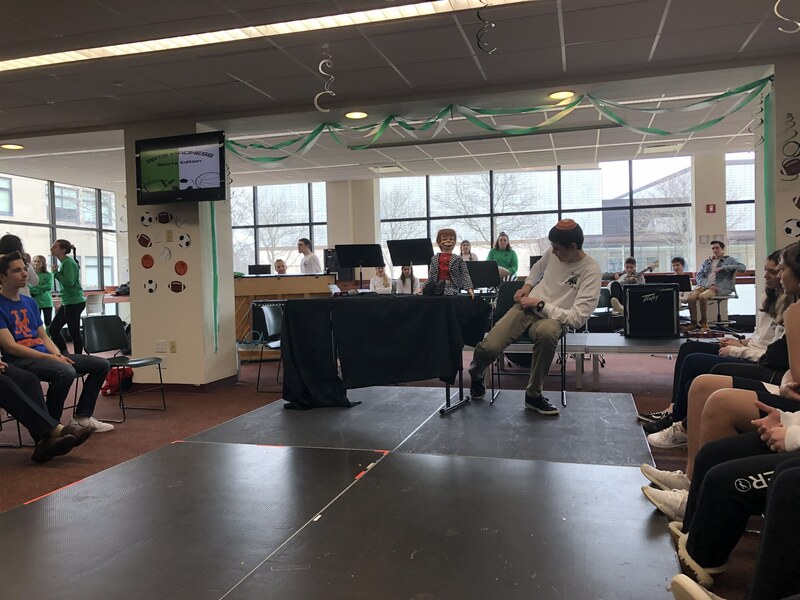 In fitting with the prominence of sports during March Madness, SW Arts decided to theme different aspects of the performance around sports. The Media Center was adorned with sports decorations and the performers were split into two teams, white and green, fitting with the colors of SW. Additionally, every performer wore a custom ‘jersey’ with their team color and the name of their favorite performer written on the back. The entire process to make Arts Madness proved to be very time consuming. “Every week we would have [a] meeting with the student-run Arts board where we would discuss the theme and the songs. 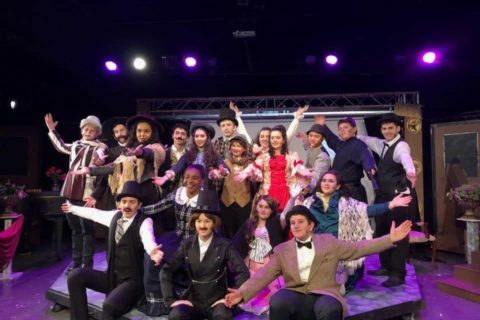 However, it was all worth it because it turned out so well.” said sophomore and vice president of SW Arts Alison Kessler. The program was emceed by Kessler and junior Karizmah Brauner, opening with a skit and an opening number relating to the theme. Any student who wanted to perform a song or participate in Arts Madness was given the opportunity to. 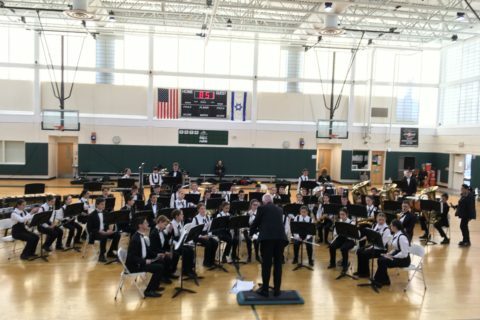 “Regardless of whether [students] were previously involved in Schechter Arts, students were encouraged and able to showcase their talent in Arts Madness,” said junior and president of SW Arts Emily Ferry. 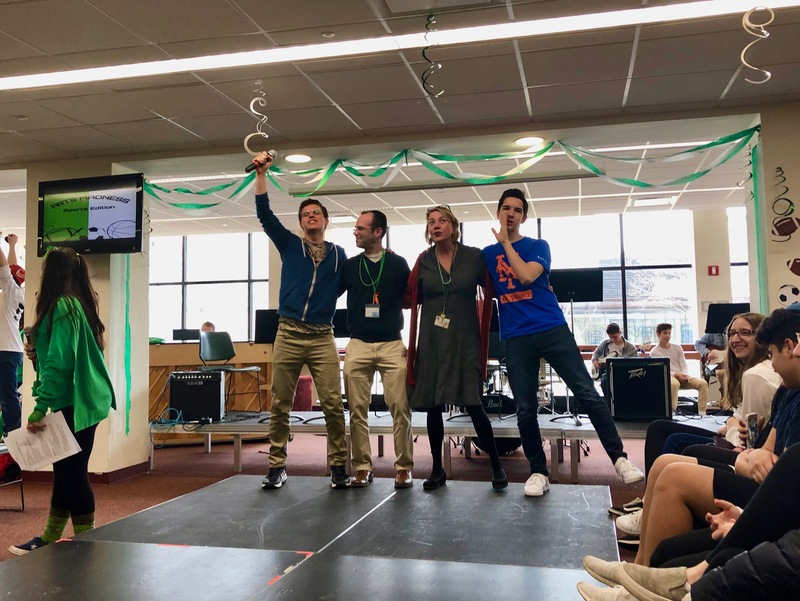 Sophomore Yoni Semel accompanied sophomores Doron Lowenberg, Ariel Jesselson, and Kobi Holmgren during their performance of the song “Sweet Victory.” “I loved being involved in Arts Madness because I got to show off my talent to the school which I don’t typically do,” said Semel. For the first time in front of the student body, SW’s Chamber Ensemble performed the “Third Brandenburg Concerto” by Bach, played by junior Moshe Kruger, sophomore Sarah Grand, sophomore Eitan Zemel, junior Ashley Mufson, and junior Jacob Weisberg. “I think our performance was good, we had to prepare the piece a bit last minute, but in the end after many rehearsals we were able to pull all the parts together and give a performance that we were proud of,” said Grand. 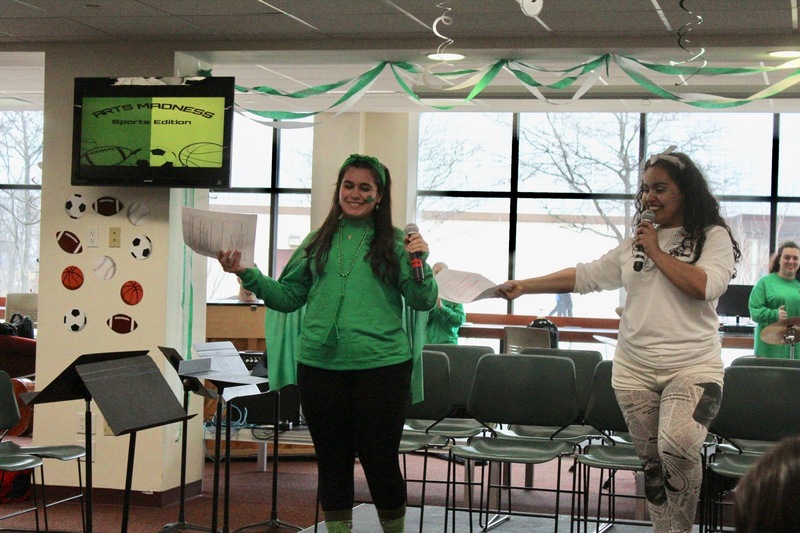 Another song, “I Guess I Miss You” from Spongebob the Musical, was performed by juniors Rachel Amar and Shira Holtz. 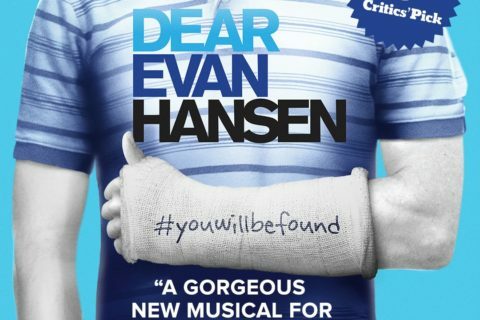 Amar shared that once she had seen Spongebob the Musical, she had immediately decided that she wanted to perform “I Guess I Missed You” because it resonated with her. Amar and Holtz, leading up to the performance, prepared the song in a unique way. “We taught ourselves the song during P.E. by listening to the soundtrack…we literally had to decipher the harmonies ourselves,” said Amar. 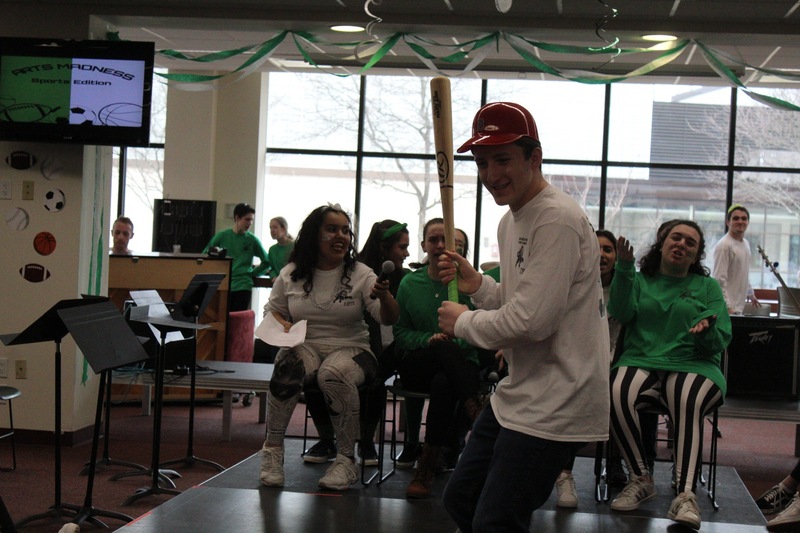 Junior Olivier Mastey performed a comedy routine which consisted of material relating to sports and puns in reference with the school’s new name, The Leffell School. Additionally, he incorporated numbers into his routine, in reference to Head of School Dr. Michael Kay’s use of numbers in his speeches. This was Mastey’s first time performing in a Schechter Arts production. “[Performing was] really nerve wracking because I didn’t want to do it and I never really do public speaking but in the end I’m happy I did it because I ended up having a good time and made people laugh,” Mastey said. There were many goals that were set in order to make Arts Madness the performance that it was. However, the main goal was to “bring awareness to the talent and dedication to the Arts that we have SW,” said Kessler. The next SW Arts event, SpringFest, will take place this coming Thursday, April 11, 2019 at the Upper School. Similar to Arts Madness, the event will have performing arts elements, in addition to a visual arts component to the evening.